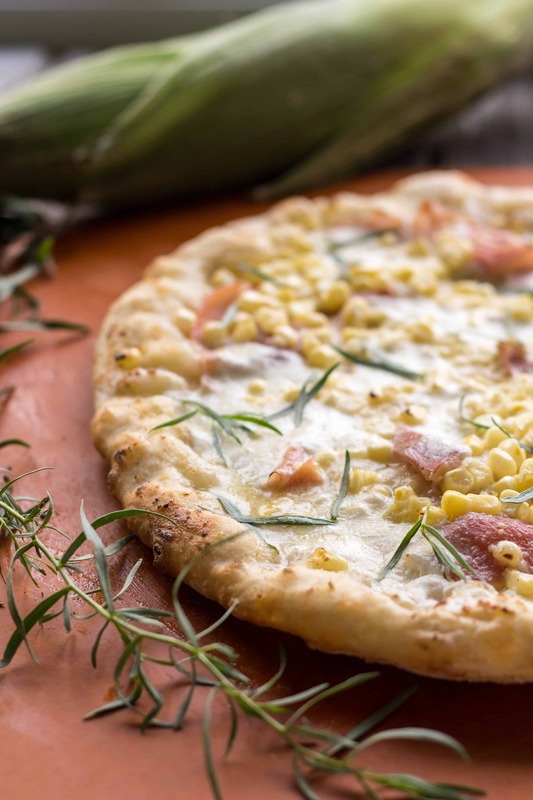 This awesome recipe for Grilled Pizzas with Corn + Prosciutto is a white pizza recipe that pairs sweet summer corn with salty prosciutto, creamy mozzarella and finished with fresh tarragon. Makes a lovely summer dinner! Oh, hey there! Hello! Buon Giorno! Ciao! Remember me? I’m that girl who promised to post recipes and photos twice a week while away in Italy, but instead left you all with radio silence for two solid weeks. Yeah. Sorry about that, y’all. You see, I had the best of intentions to keep up with my regular posts while gone. I really did! I thought it would be no problem to sift through photos and tinker with recipes during any downtime. The problem was, we didn’t really have any down time. My plans were further foiled when I realized looking at a computer screen on a train made me feel like I was going to barf. A few days in, I realized it just wasn’t going to happen, so I accepted it and moved on. Lesson learned: when in Italy, just be in Italy. Don’t worry so much about getting things done. That’s not why you’re there. So, here we are. I’m back! Bright eyed, bushy tailed (as of 4am this morning – jet lag is real you guys! ), inspired and ready to take on the world. Vacations are obviously great for rest, relaxation and seeing new places, but one of their less-talked-about benefits is how much they make you appreciate life at home. Italy was beyond amazing, but it feels really good to be back. I missed sleeping in my own bed, tending to my horrendously overgrown garden, and most importantly, being in my kitchen! This is a recipe I started working on before we left for our trip, and was hoping to gain a bit more insight while there (I didn’t). It’s good. Really good! But it needs improvement. Not in the flavors – those are all super spot on. It’s the technique I’ve been struggling to perfect. 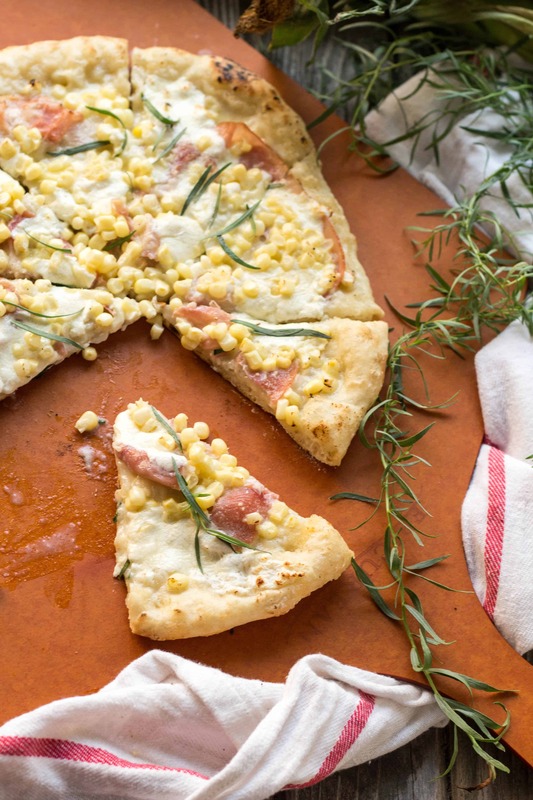 Proscuitto, in addition to fresh, sweet corn, is the shining star of these little za’s. I’m lucky that where I live we have access to the really good stuff: Jersey Fresh sweet white corn, freshly made mozzarella and salty imported prosciutto. Because we’re working with such simple ingredients here, it really does matter that you use the best possible quality you can find. My food philosophy has always revolved around using great ingredients and not overcomplicating things, and my trip to Italy has only strengthened that belief. The food there is dead simple, but the quality of ingredients and the attention to good technique are what make it so special. Topping the dough and sliding it directly on to the grates (best results thus far). Topping the dough and sliding it on to a pizza stone that’s been preheated on the grates. Sliding the bare dough directly on to the grates, flipping it, then topping. Though still really good, none of these methods have resulted in an ideal final product. I’m a perfectionist at heart, and perfect pizza is something everyone should experience in their lifetime. Luckily, this pizza doesn’t need to be grilled at all, but it was 80 degrees outside when I developed this recipe, and there was no way in hell I was about to turn on the oven. At the end of the day, even bad pizza is still pretty damn satisfying, and this pizza is a far cry from bad. Do you have any pizza grilling advice for me? I’d love to hear it! And I’m sure you’re itching to hear all about my travels, so I’ll be posting extra this week to make up for my lack of blogging during the trip. I can’t wait to tell you all about the beautiful cities we visited, and of course, all the incredible food we stuffed into our bellies. Add the flour, yeast, and salt to a medium bowl and mix to combine. Pour in the water and mix thoroughly with a wooden spoon until all the flour is moistened. Cover the bowl with plastic wrap or a kitchen towel and allow it to rise at room temperature (low 70s) for approximately 18 hours or until it has more than doubled in size. If the room is very cool it will take longer, and if it's hot, the process will happen much faster. Check it's progress every so often. Scrape out the dough onto a generously floured work surface. Use a spatula or bench scraper to divide the dough into 4 equal parts, and then gently shape them into balls by folding each corner of the dough into the middle. Use a delicate touch to form them into rounds, and place them seam side down onto a well floured surface. It's important not to knead or overwork the dough, treat it very delicately. If the balls are sticky, dust them with a bit more flour. Allow the balls to rest for about 15 minutes, covered with a damp tea towel before stretching out. At this point, the dough can be refrigerated for up to days. Just return to room temperature for about 2-3 hours before proceeding with the recipe. Preheat a grill to medium heat OR preheat an oven with a pizza stone to 500 degrees. Generously flour a pizza peel or the back of a large sheet pan, and place one ball of dough in the center. Use your hands to gently press the mound into a larger circle. Pick it up and rotate it around in your hands, delicately stretching it until it has reached the desired size and thickness. I try to make mine as thin as possible, but if it's your first time, I suggest going a bit thicker to prevent tears. Lay the dough on the floured pizza peel and spread 1/4 of the creme fraiche out in an even layer. Tear pieces of the fresh mozzarella and scatter them around the pie. 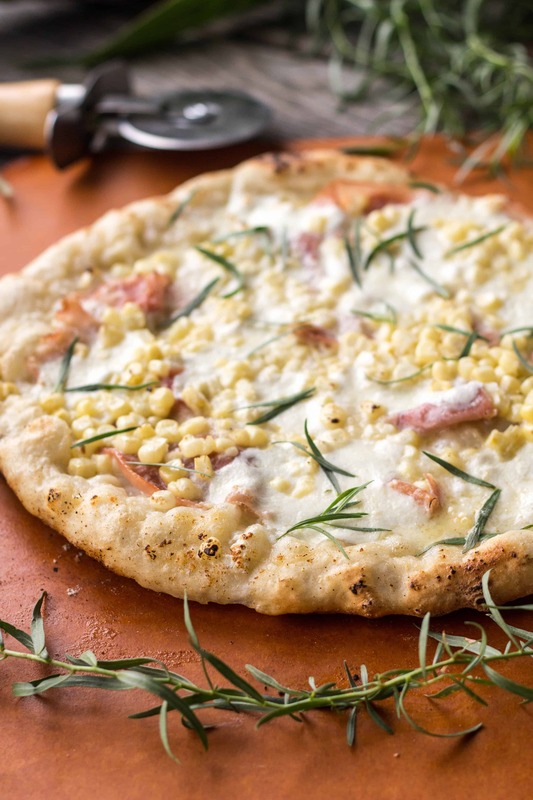 Next, tear a few pieces of prosciutto and arrange them around, followed by a sprinkling of sweet corn and Parmigianno. Take the peel outside to the grill (or oven) and use a quick jerking motion to slide it directly onto the grates (or pizza stone if using the oven). Turn the heat down (on the grill only - keep the oven hot) and immediately close the lid. Let it cook, without peaking, for 10 minutes. After 10 minutes, check it and rotate it if it's not cooking evenly. Close the lid and continue to cook until the crust is crispy and the cheese is fully melted, but try to avoid peeking as that will hinder the top from cooking. 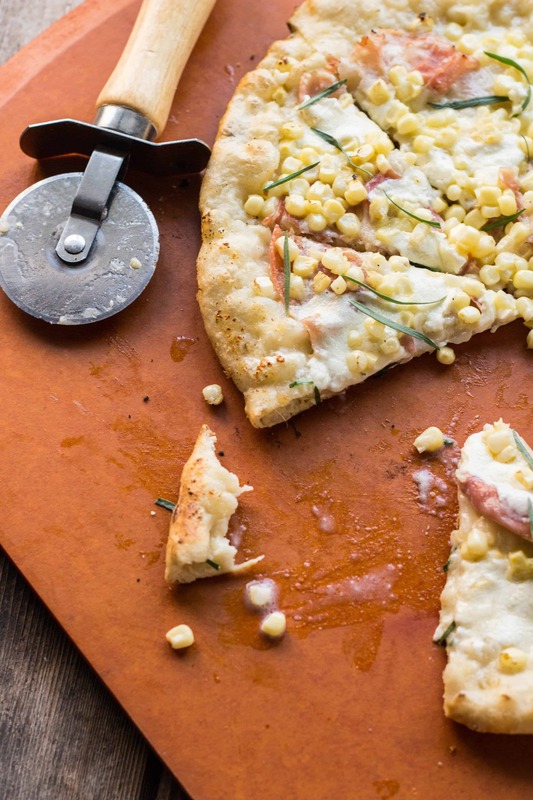 Slide the peel under the pizza and remove it from the grill, then slide it off onto a cutting board. Sprinkle with the tarragon, then let sit for a few minutes before cutting - this will allow it to set up a bit so it doesn't ooze everywhere. Repeat with the remaining dough and toppings, and serve hot or at room temperature. 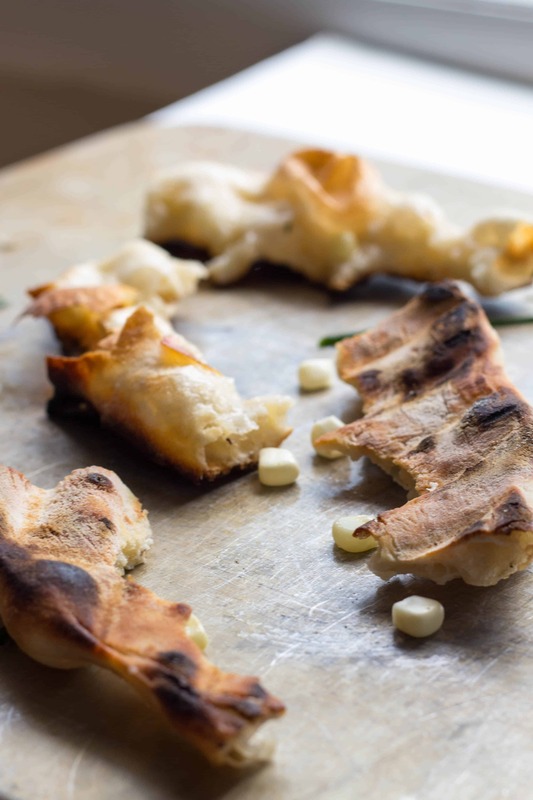 This is my favorite pizza dough recipe, though it does require planning in advance. Substitute your favorite dough recipe, or in a pinch, pick some up from your local pizzeria. Can't find creme fraiche? Substitute 1 cup of sour cream whisked together with 3 tablespoons heavy cream. Locals, find it at Mazzeo's in Northfield. I happened upon a method that seem to work for me, but first a caveat. Because I have a large family, I have a 6 burner gas stove. Turning all burners on high gets it well above 700 degrees. What I have had success with (discovered more by accident) is that I take a sheet of aluminum foil under the stones that are placed on the grill (ok, full disclosure, I really wanted pizza, but was too lazy to properly clean the grill and didn’t want the stones full of crap on the bottom). In theory, this may reflect enough of the heat that the top cooks along with the bottom. I dunno. It does work. I have also tried putting foil and cast iron pans on the warming rack to reflect what down onto the top, didn’t seem to make a difference. I was thinking of getting a couple bricks and taking the large cast iron pan just above the pizza, but so far my method has worked. I don’t like the flip method, but primarily because I like a higher moisture content in my doughs (usually working with 65%). Thanks Rod! This is great advice. I think one of my problems lies in the fact that our grill has seen better days. It doesn’t heat evenly (although, does any grill?). I’ll be playing around with your method soon. I appreciate the insight! It’s a bit tricky to get the pizza in and out of the thing, but overall it does create a nice hot oven with fairly even heat. In the end, I think great pizza is a matter of practice and dedication. Hey lady!!! Thanks! I remember seeing this pizza kettle somewhere before – its interesting! Your bother likes it? We don’t have a weber grill (although we do have a little weber charcoal grill? ), but our gas grill is also due for an upgrade very soon – which may be part of the problem in the first place. It’s an add-on for a classic Weber charcoal grill. Yes, an old gas grill could be a problem. Our last one wasn’t so hot in it’s final days before we kicked it to the curb. Christmas is coming soon…. Good to have you back! I cannot speak from personal experience but my cousin’s daughter swears by her Big Green Egg for her hand formed pizzas. She makes them all of the time and I’m told that they are perfectly cooked. Having said that, when I did make pizza I used the method that Morgan recommends (except for the freezing part – yikes! That might just be a sacrilege!). Good luck. Thanks Uncle Joe! I’ll give this method another try, especially now since the weather has cooled off a bit. Truth be told, I cheated and used the broiler to get the crust to brown and cheese to melt for the pictures. But it killed me to turn on the oven in that heat. I want to perfect the grilled pizza without having to use the oven at all! Yum! This looks so fresh, and flavorful! A great way to celebrate pizza during National Pizza Month! LOVE the flavor combo at work here. I can practically taste the nice, lightly charred crust!